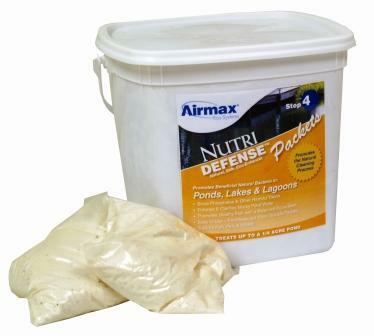 Nutri-Defense works by binding up excess nutrients, feeding Pond-Clear bacteria and polishing pond water. Nutri-Defense works by binding up excess nutrients, feeding Pond-Clear bacteria and polishing pond water. After Nutri-Defense has bound up the excess nutrients, the nutrients sink to the bottom, out of the water column. It is at this stage that Pond-Clear is able to further break the nutrients down, reducing the chance of future growth. Nutri-Defense allows you to "manage the nutrients" so you can manage water clarity. Why is Nutri-Defense so important for my pond's health? Nutri-Defense has three unique characteristics. First, it binds and sinks free-floating microscopic problem causing nutrients. Second, Nutri-Defense promotes Pond-Clear and other natural beneficial bacteria to further break down nutrients. Third, Nutri-Defense can also be used as a natural flocculent settling the larger particulate out of the water column, leaving your pond clean and clear. Do Not open packets. Packets are to be applied directly to the water. Distribute packets from shore or boat. Nutri-Defense packets work best when evenly disbursed across the body of water. In general, (2) Nutri-Defense applications are sufficient for season-long effectiveness when used as part of the 4-Step Eco-System. Nutri-Defense can also be a useful tool after heavy rainfalls, fertilizer applications, or after a chemical application to absorb nutrients from rotting vegetation. When this is the case, follow murky water dosage rate. allowing 4 weeks between treatments.